Nous n'avons pas eu le temps d'en faire une news lundi dernier, mais le chapitre 6 de Dwellers in Darkness avait été ajouté. Aussi, le nouveau chapitre de Brothers in Arms vient de sortir aujourd'hui. Le Chapitre raconte ce qui advient des Toa Mahri après l'arrivée des Visorak sur Artidax. Toa Jaller stood on the beach of Artidax, his body locked rigid by Takadox’s hypnotic trance. Next to him, Hahli and Nuparu stood, similarly paralyzed. None of the three were aware of what was going on around them, which was probably for the best. Artidax was about to be the scene of a disaster. Its volcano was mere moments away from exploding, raining fire and ash on anything unfortunate enough to be around. Not knowing this, the Toa Mahri had brought the Heart of the Visorak here, a beacon that would summon the entire Visorak horde to this spot. The idea had been to strand them here. What no one knew was that Takadox was hiding on this island, and he hypnotized the three Toa and stole their ship, intending to make his escape. Worse, the Visorak had arrived, and were even now scuttling across the beach toward the Toa Mahri. Visorak, it is said, never forget. The specimens now approaching the Toa Mahri had seen Toa before, 1000 years or so ago in Metru Nui. It had been a different team, of course, but to Visorak, one Toa looks much like another. They could remember, if dimly, the pain the Toa had caused them, and they could remember the hate. But they recalled one thing more. Toa might appear weak, beaten, or defeated, and then suddenly lash out with devastating effectiveness. It wouldn’t do to rush up to their apparently helpless foes and possibly walk into a trap. So they hung back a bit, cautiously probing to see if the Toa would react. Others began to scout – if these Toa really were frozen, as they seemed to be, something had done it to them. Could that something still be on the island, waiting to do it to the Visorak? Jaller had a thought. This was very strange, as he wasn’t capable of thinking at the moment. But some tiny part of his consciousness that was still active realized the answer: the thought was not his. This is no way for a Toa to die. That little spark of awareness was followed by a slightly larger one of recognition. He had heard that voice before. It belonged to Makuta. Although it had sounded different when it came from the mouth of the robotic Maxilos, the arrogant one was the same. The voice continued. Paralyzed on a beach, about to be slain by Visorak or incinerated by lava? Is that the stuff of which legends are made? I think not. No, don’t bother looking around for me … not that you could, in your condition. I am not on Artidax, but somewhere far away. Still, my powers have increased, so I can see and speak to you just the same. Jaller, Jaller … Vakama had such hopes for you, and look at you now. As a Toa, you make a good statue. Jaller felt a sudden jolt of pain, sharp and agonizing. It cut through the fog caused by Takadox’s hypnosis. In that moment, he awakened, his mind reeling. Someone had been talking to him … but who? What had they said? What had just happened? There wasn’t time to puzzle it out, not with Nuparu and Hahli in trances and Visorak now closing in. With no other choice, Jaller hurled small fireballs at his two partners, just enough to singe them. As he hoped, the pain shocked them awake. Hahli was already at work, summoning a wall of water to smash into the oncoming Visorak. Jaller threw up a wall of flame to block those coming from behind. Both Toa and Visorak alike froze at the sound of a rumble like thunder, coming from the volcano. “Our ship is gone!” said Nuparu. A half dozen Visorak moved on them. A shot from his Cordak blaster convinced them to back off. “Then we swim,” said Jaller. “To where? We’re in the middle of nowhere,” Nuparu pointed out. “Did I ever tell you how much I love the water?” said Nuparu. Triggering his elemental power, he churned up the ground in front of the Toa, creating a path temporarily free of Visorak leading to the water. The three broke into a run and dove into the ocean. Behind them, the Visorak milled about for a moment, confused. Their prey was getting away, but the Heart of the Visorak was here. They had to stay where the Heart was, didn’t they? Out in the water, the Toa were battling their way through more of the Visorak horde, all headed inexorably for the island. Jaller looked over his shoulder. For a moment, he was tempted to destroy the Heart. But that would mean having a horde of Visorak on he and his friends in a moment. It’s what a Toa should do, he thought. Toa don’t kill, after all … or help someone else do it. But maybe this is a new world – one where you can’t trust your friends or your enemies. Maybe all we can do is try to stay alive. The Toa were still too close when the Artidax volcano exploded. Hahli grabbed her two friends and pulled them underwater just as flaming chunks of rock started landing all around them. On the beach, the assembled Visorak found themselves too close to the disaster to escape. The horde, which had brought pain and death to so many, now reaped the reward for their acts. Alors qu'aucun des trois Toa Mahri présent sur Artidax n'était conscient, Toa Jaller eut une pensée : ce n'est pas un moyen de mourir pour un Toa. Déjà étonnant, du fait qu'il ne pouvait pas être conscient, étant donné qu'il était sous l'effet d'hypnose de Takadox, il y eut plus étonnant : cette voix appartenait à Makuta Teridax. Cette voix continua, lui disant qu'elle (la voix, qui était celle de Teridax) était loin d'Artidax, et qu'il était devenu plus puissant, assez pour lui parler de là. Le Chapitre raconte la bataille sur Destral, pendant laquelle Tobduk se bat contre l'énergie de Tridax et Mazeka se 'bat' contre Vezon. Tobduk regardait les restes de l’armure du Makuta se dissoudre face au virus mangeur de Protosteel. Cela ne lui laissait que son Antidermis qui flottait librement pour se débrouiller. Pendant ce temps, la forteresse de Destral continuait de remuer et de s’écrouler face à l’offensive extérieure. L’Antidermis qui flottait au milieu de la sale prit une teinte plus sombre de noir et vert. Tobduk ne doutait pas que le Makuta essayait de l’attaquer mentalement… Ou même peut-être supplier pour sa vie ? Mais avec ses boucliers mentaux activés, rien ne passait. Cela valait mieux, cependant. Il détestait écouter un nuage de gaz pleurer. Tobduk sourit et sortit un bâton à l’air mauvais. Sur son manche étaient inscrits des symboles Matoran et sa tête était sculptée à l’effigie d’une Vipère Maudite. « Bien, laisse-moi te raconter quelque chose. J’étais habitué à vivre sur un île à l’Est… Juste un simple endroit, où certains d’entre nous essayaient d’aller certains jours. Nous avions de petits problèmes de Rahi, mais rien de très sérieux. Du moins, avant qu’un Makuta n’y arrive. Un rayon d’énergie blanche, chaude, émergea du bâton de Tobduk. Il toucha l’Antidermis dans l’air, l’incinérant en un laps de temps. Tobduk n’arrêta pas avant que chaque particule ne soit partie. « Impressionnant, » dit Mazeka depuis l’entrée. « Il est mort, » mentit Mazeka. Il n’avait aucune idée de qui était ce Vezon, mais il n’avait pas de raison de le tuer non plus. Il décida de le laisser prendre ses chances avec l’armée derrière la porte, malgré les maigres chances qu’il avait. « Et pour tous ces Toa ? » demanda Mazeka. Mazeka réfléchit. Les vies d’une poignée de Toa qu’il ne connaissait pas ou arrêter le mal quelconque que Vultraz avait prévu. Il savait ce que ferait un Toa – risquer le plus possible pour sauver ceux sans aide et laisser les méchants s’échapper, laissant peut-être plus de vies en danger ainsi. Mais c’était peut-être pour cela qu’il n’y avait qu’un peu plus de 50 Toa restants dans l’Univers… Et, quoiqu’il en soit, Mazeka n’en faisait pas partie. Quand le Matoran et l’agent de l’Ordre eurent disparu de la chambre, Vezon sortit de l’ombre. Destral tombait en pièces tout autour de lui, mais il l’ignora. Ses yeux étaient fixés sur ces tubes de cristal et les Toa qui reposaient à l’intérieur. Que ne ferais-je pas avec une armée de Toa de mon côté ? Mazeka escorte Vezon, avant de le prévenir qu'il doit le tuer. Pendant ce temps, Tobduk parle à l'énergie de Tridax, son corps s'étant fait entièrement dissoudre. Il lui dit qu'autrefois, il habitait une île paisible, jusqu'à ce qu'un Makuta vienne y faire des expérience pour créer des Rahi. En peu de temps, il créa une araignée Visorak, et bien d'autres, et, pour voir de quoi elles étaient capable, il les envoya attaquer l'île. Au final, il rebaptisa l'île 'Visorak' (explication du mystère de l'île 'Visorak' sur la carte de l'Univers Matoran). Quant à Tobduk, qui ne s'appelait pas réellement ainsi auparavant, il réussit à fuir, s'en alla vers Nynrah, vers Stelt, puis il fut sauvé, et ses sauveurs le renommèrent 'Tobduk' (qui signifie Survivant en langage Matoran). Il utilisa ensuite son bâton qui, à l'aide de son pouvoir, désintégra l'énergie de Tridax. Il interrogea Mazeka pour ce qui était de Vezon, il lui répondit qu'il était mort. Cependant, le Matoran avait menti, il ne savait pas ce qui en était advenu. Quand ils furent partis, Vezon sortit de l'ombre et, en regardant les Takanuva de l'Ombre, pensa : "Que ne pourrais-je pas faire avec une armée de Toa de mon côté ?" Bons chapitres !!! Cela me fait penser à Star Wars, Vezon à la tête de Takanuva corrumpus à Dark Vador à l'avant de l'armée des Clones. :) Mais le double jeu de Vezon risque de lui être fatal !! Dark Vador est pas aussi allumé que Vezon... Mais à mon avis, Vezon ne va pas cacher son armée de Toa. Justement, il est complétement félés ! ( Vezon ) Mais il va faire son puissant avec son armée.! Est alors l'Ordre de Mata-Nui va le zigouiller !! Justement, il est complétement félés ! ( Vezon ) Mais il va faire son puissant avec son armée.! Et alors l'Ordre de Mata-Nui va le zigouiller !! Bons chapitres, et retour en force de Vezon! Oui !!! Mais bientôt son plan ( si il ne fait pas ça par pur folie ) se retournera contre lui !!! Chaqua plan ou chaque arme à un défaut !! Il va finir comme Octopus : Tué par son arme !! Les Takanuva de l'Ombre sont comme celui de 2008? Non,je dirais plutôt comme celui de 2003,mais en noir. Super intéressant ! Mais Vezon est fou, et non bête, il sait sûrement ce qu'il peut faire avec ça. Peut-être va-t-il rejoindre Teridax. Je ne pense pas que Teridax ait besoin de lui, avec son plan il est prévu de faire mourrir tout ses frêres. je pense que Teridax n'en a rien à foutre d'un sacrifice de plus. Je viens de finir BiA, je vais m'attaquer à DiD. Hah, je sais pas, on va bien voir par la suite ! D'un côté, si, c'était pendant la guerre. Oui,mais on va dire pas dans le champ de bataille. Toa Jaller était debout sur la plage d’Artidax, son corps dans un état rigide causé par la transe hypnotique de Takadox. A ses côtés, Hahli et Nuparu se tenaient debout, paralysés eux aussi. Aucun des trois n’était conscient de ce qui se passait autour d’eux, et cela valait sans doute mieux. Artidax était sur le point d’être la scène d’un désastre. Son volcan allait exploser d’un moment à l’autre, faisant pleuvoir feu et cendres sur tous ceux assez infortunés pour s’aventurer autour. Sans savoir cela, les Toa Mahri avaient apporté le Cœur des Visorak ici, une balise qui pourrait invoquer les Hordes Visorak entières à ce signal. L’idée était de les rassembler ici. Ce qu’aucun ne savait était que Takadox se cachait sur l’île et il hypnotisa les trois Toa et vola leur bateau, afin de s’échapper. Pire encore, les Visorak étaient arrivées, et détalaient à ce moment à travers la plage des Toa Mahri. Les Visorak, dit-on, n’oublient jamais. Les spécimens qui approchaient maintenant les Toa Mahri avaient vu des Toa auparavant, 1000 ans et quelques auparavant sur Metru Nui. C’était une équipe différente, bien sûr, mais pour les Visorak, un Toa est semblable à un autre. Ils pouvaient se souvenir, du moins à peu près, de la souffrance que les Toa leur avaient causée, et ils se souvenaient de la haine. Mais ils se souvenaient d’autre chose. Les Toa pouvaient sembler affaiblis, battus, ou vaincus, puis frapper avec une force dévastatrice. Cela ne marcherait pas de foncer dans leurs ennemis apparemment sans aide et de tomber peut-être dans un piège. Alors certains reculèrent légèrement pour voir la réaction des Toa. D’autres commencèrent à partir en éclaireurs – si ces Toa étaient réellement glacés, comme ils semblaient l’être, quelque chose les avait rendus ainsi. Et si ce quelque chose était toujours sur l’île, en train d’attendre pour faire de même aux Visorak ? Jaller eut une pensée. C’était très étrange, car il n’était pas capable de penser à ce moment. Mais la légère partie de sa conscience qui était toujours active put comprendre : la pensée n’était pas la sienne. Ceci n’est pas une façon de mourir pour un Toa. La petite étincelle de conscience fut suivie par une autre, légèrement plus grande, de reconnaissance. Il avait entendu cette voix auparavant. Elle appartenait à Makuta. Bien qu’elle paraissait différente quand elle venait de la bouche du robotique Maxilos, son arrogance était la même. La voix continua. Paralysé sur une plage, sur le point d’être détruit par les Visorak ou incinéré par la lave ? Est-ce de cela que sont créées les légendes ? Je ne pense pas. Non, ne t’occupe pas de regarder autour de toi pour me trouver… Tu n’en serais pas capable, dans ta position. Je ne suis pas sur Artidax, mais loin de l’île. Cependant, mon pouvoir a augmenté, alors je peux te voir et te parler de la même façon. Jaller, Jaller… Vakama espérait tant de toi, et regarde-toi maintenant. En tant que Toa, tu fais une bonne statue. Jaller sentit alors une soudaine sensation de douleur, de vivacité et d’agonie. Cela repoussa les brumes causées par l’hypnose de Takadox. A ce moment, il se réveilla, son esprit en train de s’enrouler. Quelqu’un lui avait parlé… Mais qui ? Et qu’avait-il dit ? Que s’était-il passé ? Ce n’était pas le moment de tout éclaircir, pas avec Nuparu et Hahli et transe et les Visorak se rapprochant de plus en plus. Sans autre alternative, Jaller lança de petites boules de feu à ses partenaires, juste assez pour les immoler légèrement. Tel qu’il le pensait, ils se réveillèrent tous les deux. Hahli s’était déjà mise au travail, invoquant un mur d’eau pour l’écraser contre les Visorak. Jaller créa un mur de feu pour bloquer ceux qui venaient de derrière. Les Toa et les Visorak frissonnèrent chacun au son d’une sorte de grondement de tonnerre en provenance du volcan. « Notre bateau n’est plus là ! » dit Nuparu. Une demi-douzaine de Visorak se dirigea vers eux. Un tir de blaster Cordak les convainquit de reculer. « Alors nageons, » dit Jaller. « Vers où ? Nous sommes au milieu de nulle part, » fit remarquer Nuparu. « T’ai-je déjà dit à quel point j’aime l’eau ? » dit Nuparu. En déclenchant son pouvoir élémentaire, il reforma le sol devant les Toa, créant ainsi un chemin temporairement inoccupé des Visorak qui les mènerait à l’eau. « Allons-nous-en ! » cria Jaller. Les trois commencèrent à courir et plongèrent dans l’océan. Derrière eux, les Visorak y réfléchissaient pendant un moment, confus. Leur proie s’en allait, mais le Cœur des Visorak était ici. Ils devaient toujours rester près du Cœur, n’est-ce pas ? Dans l’eau, les Toa se frayaient un chemin à travers d’autres hordes de Visorak, chacune dirigée inexorablement vers l’île. Jaller regarda au-dessus de son épaule. Pendant un moment, il fut tenté de détruire le Cœur. Mais cela voudrait dire avoir une horde de Visorak sur lui et ses amis en un instant. C’est ce qu’un Toa devrait faire, pensa-t-il. Les Toa ne tuent pas, après tout… ou aident quelqu’un à le faire. Mais peut-être que c’est un nouveau monde – un où l’on ne peut croire ni ses alliés ni ses ennemis. Peut-être que tout ce que l’on pouvait essayer de faire était de rester en vie. Les Toa étaient toujours trop près quand le volcan d’Artidax explosa. Hahli saisit ses deux amis et les tira sous l’eau alors que des morceaux de roche brûlante commençaient à atterrir tout autour d’eux. Sur la plage, les Visorak assemblées se retrouvèrent trop proche du désastre pour s’échapper. Les hordes, qui avaient apporté douleur et mort tant de fois, payaient désormais les conséquences de leurs actes. génial ! trop cool ! je vais méme lui donner un nôte: 10/10 ! Mais j'ai un doute...la "certaine personne à l'armure noire"...c'est qui? 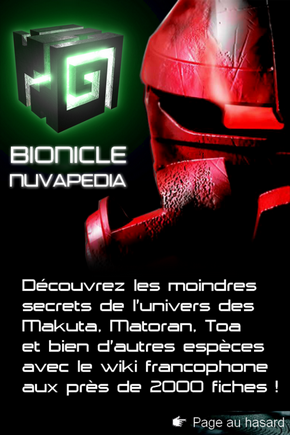 Jaller ne veut quand même pas se battre avec Vakama????? Sa m'étonnerais! il sait que Makuta Teridax est écrasé sous la porte! Et alors il était bien en forme de Maxilos l'année dernière(Teridax).